There are many ways to create and style a spring bouquet, from casual to formal. While formal arrangements can be stunning for spring weddings and bridal showers, sometimes casual and whimsical pieces can be appropriate even in the most elegant of situations. Whimsical spring bouquets reflect the freshness of the season. They’re fun, light, and playful, but they’re also beautiful so consider them for any centerpieces, bridal bouquets, or other flower arrangements that you might need. Choosing flowers for a whimsical spring bouquet is easy. Look for blossoms that are airy and bursting with newness. 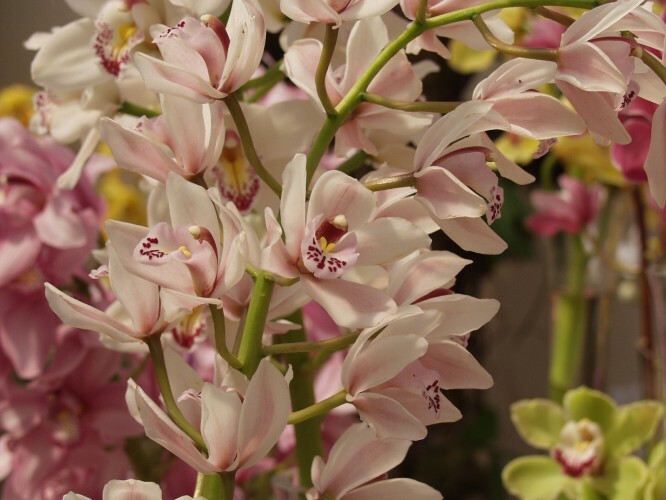 Consider cymbidium or dembrobium orchids. Make these flowers the focal point of your floral arrangement and think about adding stunning Manzanita branches for contrast. Once you’ve chosen flowers for your whimsical floral arrangement, you’ll need to find a container to secure them in. A square wood box can be lovely, as can a light-colored ceramic vase. You don’t need much filler, if any, as the orchids and Manzanita branches (or whatever flowers you choose) will be fully on display as perfect essences of spring. If you want to add a bit more whimsy to your bouquet, you can hang decorations on the Manzanita branches. Consider stones or gems. Or, if you’re constructing your bouquet in a vase, you can put colored glass rocks in the bottom. A whimsical spring bouquet has so many possibilities. It’s fun to use imagination to make up an arrangement that’s perfectly suited for the whimsy of the floral designer. Do you like to create spring arrangements? If so, what would you use to make a whimsical spring bouquet? We’d love to hear from you in the comments below! There are many ways to create and style a spring bouquet, from casual to formal. While formal arrangements can be stunning for spring weddings and bridal showers, sometimes casual and whimsical pieces can be appropriate even in the most elegant of situations. Whimsical spring bouquets reflect the freshness of the season. They’re fun, light, and playful, but they’re also beautiful so consider them for any centerpieces, bridal bouquets, or other flower arrangements that you might need.